Bryana Belin, Doris Tamayo-Sanchez, and Michelle Santos Pacheco presenting their work at the annual Society for Neuroscience meeting in Chicago. The Calisi Lab supports a large, undergraduate research program in animal science, neuroendocrinology, and reproductive behavior. Students intern for a minimum of one year for 10hr/week or more, mentored by graduate students and postdocs in collaboration with Dr. Calisi. 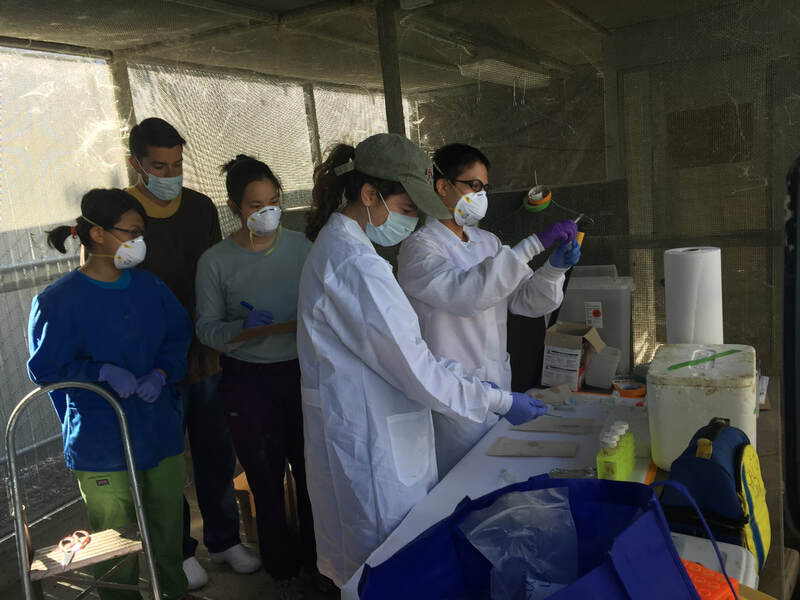 Most students begin by assisting with the research of our dove colony. First, they are trained in animal husbandry, health checks, and how to observe and document animal behavior data. As these skills become mastered, there is room for growth within the lab assisting in specific projects, assays, techniques, field collections, data analyses, and manuscript write-up in significant ways and potentially conducting a senior thesis. Undergraduate student alumni have continued on to competitive PhD Programs, including Columbia University (Sana Chintamin and Steffani Siller), UC Davis (Lea Pollack), UC Riverside (Catherine Nguyen), and Masters programs, including San Francisco State University (Hanna Butler-Struben). Our undergraduates have also been accepted to MD and DVM programs, including Stanford University School of Medicine (Nelson Amorín), State University of New York (SUNY) Downstate College of Medicine (Jessamine Fazli), and Cornell College of Veterinary Medicine (Yanick Couture). We also encourage the pursuit of other STEM careers, and many of our undergraduates are interested in pursuing careers in science education and communication, so look out for them! Are you an undergraduate interested in joining our lab? Check out how to apply here. A hallmark of the UC Davis undergraduate experience is working alongside graduate students and faculty to conduct scientific research. But too often, undergraduates must make a difficult choice between accepting an unpaid internship or finding a part-time job unrelated to their academic interests. Ondrasek, N.R., Freeman, S.M., Saldana, E., Orellana Bonilla, I., Bales, K.L. and Calisi, R.M. 2018. Nonapeptide receptor distributions in promising avian models for social neuroecology. Frontiers in Ecology and Evolution. (in press). Ligocki, I., Munson, A., Farrar, V., Viernes, R*., Calisi, R.M. (2017, submitted) Behavioral, neuroendocrine, and reproductive implications of exposure to an endocrine disrupting pesticide in Gambusia affinis. Abstract. Poster intended to be presented by Ligocki and Viernes at the annual conference for the Society for Integrative and Comparative Biology, San Francisco, CA, Jan 2018. Nava Ultreras, B. *, Farrar, V., Austin, S., Calisi, R.M. (2017, submitted) Got milk? Gene expression of prolactin and its receptor in lactating rock doves. Abstract. Poster intended for presentation by Nava Ultreras at the annual conference for the Society for Integrative and Comparative Biology, San Francisco, CA, Jan 2018. Nava Ultreras, B. *, Farrar, V., Calisi, R.M. (2017).Prolactin receptor expression across parental care in rock doves. Abstract. Poster presented by Nava Ultreras at the UC Davis Annual Conference for Undergraduate Research, 2017. Nguyen, C.*, Austin, S., Calisi, R.M. (2017) Do socially dominant parents have better quality offspring? Abstract. 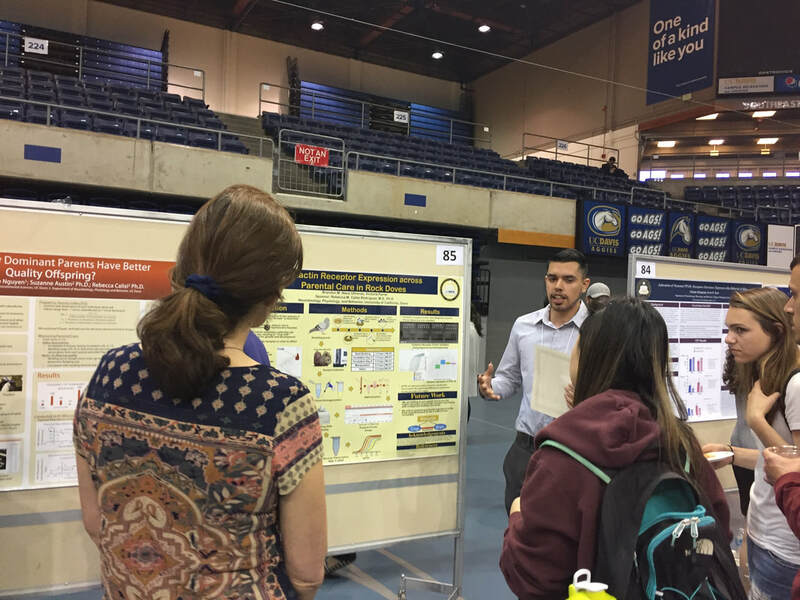 Poster presented by Nguyen at the UC Davis Annual Conference for Undergraduate Research, 2017. Amorín, N.A*., Bentley, G.E., Calisi, R.M. (2015) GnRH-I and GnIH cell soma size and peptide concentration change with season, nest box status, and circulating testosterone in European starlings. Abstract. Poster presented by Amorín at the annual conference for the Society for Integrative and Comparative Biology, West Palm Beach, FL, Jan 2015. Belin, B. * Tamayo-Sanchez, D*. Santos Pacheco, M.*, Love, A., DuRant, S., Dickens, M., Calisi, R.M. (2015) Acclimation to captivity: the neuroendocrinology of wild-caught house sparrows. Abstract. 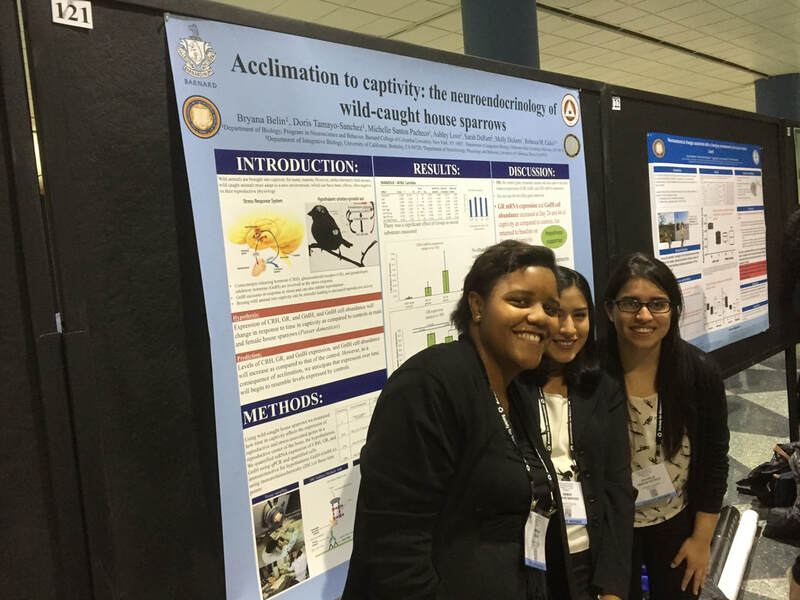 Poster presented by Belin, Tamoyo-Sanchez, and Santos Pacheco at the annual conference for the Society for Neuroscience, Chicago, IL, Nov 2015. Chintamen, S*., Calisi, R.M., Kriegsfeld, L.J., Rosenblum, E.B. (2015) Use it or Lose it: Neuoanatomical evolution in response to a changing environment. Poster presented by Chintamen at the annual conference for the Society for Integrative and Comparative Biology, West Palm Beach, FL, Jan 2015. Ennin, E.* , Chintamen, S*., Romeo, R., Kriegsfeld, L.J., Rosenblum, E.B., Calisi, R.M., (2015) Neuroanatomical changes associated with a changing environment in the Lesser Earless Lizard. Abstract. Poster presented by Ennin at the annual conference for the Society for Neuroscience, Chicago, IL, Nov 2015. Support our students in need! Many of our undergraduate students face financial hardships. Often, these hardships cause students to choose between getting a job unrelated to their goals or gaining (unpaid) research experience in a lab. This perpetuates inequities in science, as students from underserved communities are typically those who are faced with this difficult situation. Help us change this. The Calisi Lab works hard to support undergraduate student salaries when grant funds are available. However, with over 20 undergraduate students in the lab, grants alone cannot fund salaries for all. Please click the DONATE button to the right to help support them! ​ These students are brilliant, hard-working, thought-leaders of tomorrow. Your tax-deductible donation will support salaries and stipends for undergraduate students in need who dream of having a career in science. 94% goes directly to the students, while 6% is used to maintain the donation site and administrative accounts. Thank you for believing in these students and investing in our future. Donors, we thank you for your support!